I am not sure when and where I tasted my first pizza. If memory serves (and it may not) it was at Pontchartrain Beach, of all places, in about 1959. Furthermore, I am not sure when I first tasted a Gibby’s pizza, perhaps a year later? But on that day, what the perfect pizza was supposed to be was eternally etched into my psyche. In the sixties dating usually meant going to a Pontchartrain Beach, a sock hop (raise your hand if you know what that is), or the movies. Going to the movies usually involved going “downtown” to the Joy, Saenger, or Orpheum. And that meant dressing up in a coat and tie for the guys and heels for the girls. For Janis and me, the evening almost always concluded with a pizza at Gibby’s on North Rampart. It was a tradition! Over the years we consumed many pizzas at Gibby’s, usually sitting at the table under the glass enclosure surrounding his kitchen, where we watched a smiling Gibby toss the spinning dough into the air before gently laying it down to receive the succulent sauce, spicy pepperoni, anise flavored Italian sausage, fresh mushrooms, and its topping of cheese. That is the way we always ordered it. I can, this day, still picture that glass cubical of a kitchen and Gibby tossing that dough, although his face is just a hazy blur, because my focus was always on the aerial dance of that hypnotically spinning dough. What a marvelous way to make food! Over the years I spent enough money on Gibby’s pizza to have contributed a substantial portion to his children’s education. This relationship went on with Gibby until 1962, when I graduated from high school and went off to college. After that most of our visits were in the summer, and even that became infrequent, because I worked in Grand Isle during the two summers before Janis and I married in 1967. Until then and whenever we were in town, we always tried to visit Gibby’s. Alas, the visits became even less frequent because we lived in Lafayette as Janis and I finished our college educations. I went off into the Air Force in December 1968 and was stationed in California, far away from any hope of a Gibby’s pizza for nearly four long years. During the last year of my service, I was stationed at a remote site in Alaska, which was an “unaccompanied tour,” meaning Janis and our infant son could not join me there. During the nine months we were separated before I could take leave and come home for 30 days, we planned what we would do when the happy day arrived. Janis would pick me up at the airport with a room reserved in a hotel in the Quarter only a few blocks from Rampart Street. The second thing we planned to do after we checked in was to go have a Gibby’s pizza. (Or maybe it was the third or fourth thing, I forget now.) This was August of 1972. My 30 days leave started off badly, a harbinger of things to come, when I was bumped from my “space available” flight out of King Salmon, AK on an Air Force C-110 by General Jimmy Doolottle’s salmon catch. Yes, I was kicked off the plane because of a bunch of fish! But they were a general’s fish! And a Medal of Honor winner so I should be honored. I managed to get out a day later and landed at Elmendorf AFB in Anchorage. I immediately applied for “space available” (free) on any military flight back to the Lower 48. I didn’t care what kind of plane it was or where in the Lower 48 it landed as long as I didn’t have to pay for an expensive commercial flight from Alaska. Two days later I was finally booked on a flight with a bunch of Ohio ANG troops returning home to Toledo from their two weeks summer training. I spent eight long hours in the cargo hold of a C-130 in a canvas jump seat with wax stuffed in my ears to drown out the droning of the engines. The whole time I dreamed about my Gibby’s pizza (and other things)! I arrived in Toledo just as the civilian terminal was closing for the night. I begged and they allowed me to spend the night in the locked terminal. The uniform must have helped. I spent a fitful night sleeping in one of the terminal chairs and took a “bath” in the men’s room the next morning, changing into a fresh uniform for the final leg of my trip home. After spending most of the day hopping from airport to airport, I finally arrived in NOLA, and Janis met me. Immediately, we went to the hotel and later headed straight to Gibby’s on North Rampart for a pizza. We rounded the corner onto North Rampart and went straight to where Gibby should be. There was a flower shop there, a (expletive deleted) flower shop! “No problem,” I tried to reassure myself. “We are just in the wrong block!” So, we went another block up North Rampart—and NO Gibby’s!! Again, I calmed my anxious self with the reassuring hope that time had played tricks on my memory, and Gibby’s was in the other direction! So, we went two blocks down, and NO GIBBY”S!!!!! I was devastated! Gibby was gone! Forever! No more smiling Gibby behind the glass! No more hypnotically spinning disks of dough! No more Gibby’s pizza! No more barfing in his bathroom! Since that fateful day, I have searched for a replacement and found none. Friends hear the story of my pizza quest and tell me about their favorite pizza place as “the best I have ever had! You must try it!” I reluctantly try them, and—nope, it is never even close. Their dough is often like soggy cardboard. Their pepperoni is nothing more than greasy, tasteless, red disks, their Italian sausage is sausage and Italian in name only. Their sauce, well, is just red, and the cheese a stringy, flavorless mass of gelatinous goo. And it sure isn’t what I remember from Gibby. Janis says I am too harsh in my judgment of latter day pizzas. And perhaps I am. I do know I am doomed to this Gibbyless hell for the rest of my life. I am, however, considering building a shrine to Gibby in the corner of my man cave. Janis thinks I am sick, and maybe she is right, but I sorely miss Gibby! UPDATE!!!!! My prayers have been answered! I have found a great pizza just two miles from my house! The Oak Oven on Jefferson Highway in Harahan opened recently, and they make outstanding pizza! It isn’t Gibby’s, but it is as good as Gibby’s in a different way. Dare I say it? Maybe even better! The chef makes his own fennel Italian sausage and uses very flavorful pepperoni. He cooks it in an oak fired oven (Gibby cooked his in a commercial pizza oven). The oak oven adds a nice smoky touch to the pizza. The thin crust is perfect! Like I said, not Gibby, different, but it is great pizza. I think I will live now. 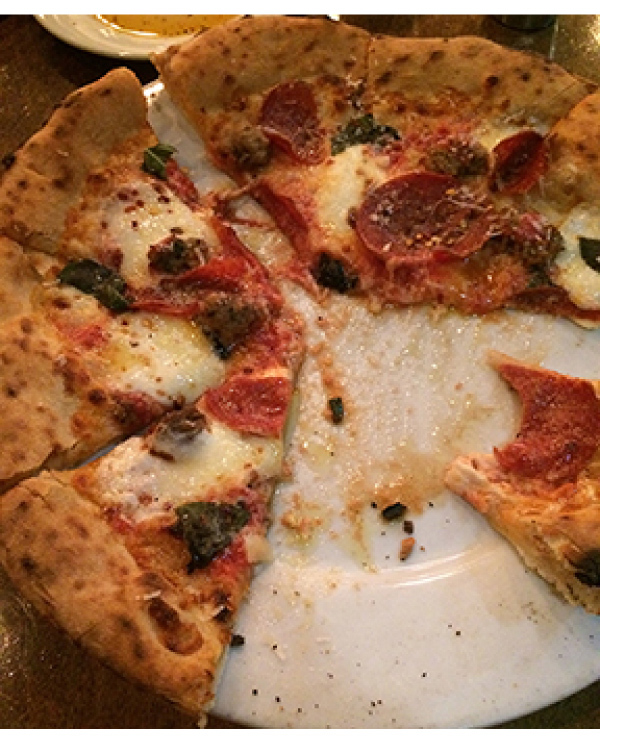 UPDATE to the UPDATE – If you want to go to Oak Oven, get a reservation. The place is small and the food is so good it is always packed. And they have many other great Italian dishes besides pizza. Best pizza in the city is Brooklyn Pizza on Vets near Clearview. But get the 13″ whole wheat pizza. If you like thin crisp crusts its the thinnest pizza I have ever tasted. Since you married one of the prettiest girls in Kenner, I would think you would have had a back up for your “first” (again) date, Cuz.